Fulfill a contract given to the Companions to hunt down an escaped criminal. 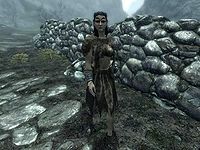 Speak to Skjor (or Vilkas if you have completed The Silver Hand) in Jorrvaskr, who will give you a quest to kill an escaped criminal in any of the nine holds. "It sounds like Eastmarch is too busy with their war to keep their own prisoners in line. One of them's escaped, and you're going to find that coward." "The braggarts in the Reach always claim that no prisoner escapes their mine. What you don't hear about are the ones who break off from escorts on the way to Markarth." "Haafingar seems to have trouble keeping their prisoners in line. One of them's escaped, and you're going to find that coward." "I'm sorry to have to send you to Hjaalmarch. I can't stand the smell of it myself. But it seems their criminals can't either and just want to get out. One of them's escaped, and you're going to find that coward." "It seems that law-breakers in the Pale have no desire to stay there. I don't blame them. One of them's escaped, and you're going to find that coward." "The idiots in Falkreath still think the best place for prisoners is that hole in the ground. No surprise, but one of them's gotten out. Again." "The so-called prison in Riften leaks like one of their fishnets. This is what happens when you let thieves run your town. The prisoners just walk right out. One of them's escaped, and you're going to find that coward." "One of the guards from Dragonsreach came to me, worried about a prisoner who's escaped. The Jarl has too much on his mind right now, we won't be troubling him with this." "The snowberries up in Winterhold have lowered themselves to ask for our help. For some reason they just throw their lawbreakers out into the sea and think that ends the problem. But every now and then, one swims back." You will have to travel to the hold and search for the criminal (your quest marker will point to them). The criminal is constantly moving which will make it harder to fast travel to them. You can engage in dialogue with the criminal but after doing so they will become hostile. At this point you can kill them without incurring a bounty. After this has been completed, return to Jorrvaskr for your reward and the words: "Bit by bit, we bring honor to this land. And you've brought honor to the Companions. More importantly, some gold." Once you have completed Glory of the Dead, this quest is available indefinitely. The line for Eastmarch which references the civil war doesn't change if you complete the civil war storyline. Sometimes the escaped criminal will be under the map and the quest will be impossible to finish. Soon the quest will be failed and the companions will think the quest is still active. On the PC, it is possible to use the console to advance through the quest by entering setstage CR07 stage, where stage is the number of the stage you wish to complete. It is not possible to un-complete (i.e. go back) quest stages, but it is possible to clear all stages of the quest using resetquest CR07. This page was last modified on 21 November 2017, at 19:39.